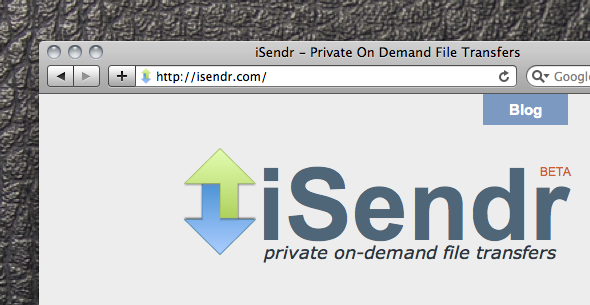 iSendr: On demand, peer-to-peer file sharing, no cloud required. If you’ve not yet fallen in love with how easy it is to transfer files with services such as Ge.tt, Rapidshare and the like, then you’ve missed out on one of the quintessential parts of having near-constant Internet in our world. While it will be hard for us to break away from our Dropbox for personal storage and occasional sharing, there’s something to be said for services that toss a file into the cloud and keep it there without penalizing you for storage space. There’s something else to be said for a service that completely bypasses the cloud entirely. iSendr is exactly that application. Based on peer-to-peer networking, iSendr allows you to share files up to 2 GB in size, without the need to store it in the cloud. Why do you care? Because not everyone wants to store things for long periods or hold sensitive information in the cloud. The site provides a few options, but very few. You can choose to send directly to a single person, or you can choose to share with a group. You can password protect your files and…that’s about all. To send a file that’s 500 MB or less, you don’t even have to sign up. If you want to go higher than that, you’ll need to create a free account. The part that we love about it is that “disposable” term. Once your file is done sending, the network is disbanded and there is no trace left to be found. iSendr simply acts as the peer matching service, but the data is not transferred over nor stored on its servers. At least that is the case for anything under 500 MB. If you choose to send something larger than that, the data will route through iSendr but it will not be stored. It’s a unique twist, and one that you’ll likely find a use for at some time or another. While we won’t be abandoning our cloud-based resources just yet, but we’ll take another option for sure.